While developing Puzzle Frenzy, I took tons of wrong decision. On multiple occasions I assumed what my game players want and I implemented several features which were never used, or used by very few users. However, over time I started to listen to what the users were asking for. By putting together all the communication channels I was able to come up with totally different features that I originally had in mind. And guess what?! by implementing those features suddenly I got more user engagement, better ratings and more downloads. Being an game or app developer is not easy and surely poses a lot of challenges. For me, one of the biggest problem was that I was putting my judgement ahead of my users feature requests. I soon as I realized that 50.000 voices are stronger than 1 (my own) the game development started to flourish. Listen to your users, they know what they want! This entry was posted in Advanced and tagged App, puzzle-frenzy, Win8, windows8 on June 7, 2014 by Mihai. I currently have two apps in the Windows Store: Puzzle Frenzy and Puzzle Frenzy Kids. I’ve been closely monitoring user rating, feedback and request from day one and tried at the same time to tweak and improve the apps. However, one thing I noticed quite fast was that my app was not getting too many ratings. Even if rating an app is possible in Windows 8 for all apps without extra work (bring up right side bar -> Settings -> Rate and review), my users were simply not doing that. On top of that, I noticed that my competitors’ apps and all the top apps in the same category had hundreds, thousands, even tens of thousands of ratings. I also realized that the more ratings an app has, the higher it is placed in the Windows Store. It goes without saying that user ratings have a significant contribution to the ranking of the app. Therefore, I decided to ask for user rating inside the apps, to see if the users will respond and rate my apps more frequently. I will ask users to rate the app only after they have engaged in (and hopefully enjoyed) the app, that is after they already played 3 puzzle games. By doing so, the users will most likely give it a good rating because they appear to have enjoyed the app enough to stay in the app and play all the 3 games. I offer the user the choice not to rate it and ask again later. I tried not to be too annoying with these requests so I only display it after 3, 7, 15 or 30 games. If even after the fifth prompt the user hasn’t rated the app, I won’t bother him again because he most likely isn’t going to rate the app anyway. I don’t bother the user again once he rated the app, but I still display a “Rate app” button on the home page, in case he changes his mind or wants to update his rating. After introducing these changes, the number of ratings I was getting increased quite a lot. In around one week I started to get the same number of ratings which before I was getting in one month. As a consequence, (there were other factors for sure, but the user rating prompt was most likely the most important) the apps got ranked higher and higher, and they started getting more downloads. On average, now I get around twice as many downloads as I did before. I highly recommend adding such prompt to anyone developing apps on any platform. Be ready however, with more ratings and feedback comes more responsibility. Take user feedback into account and react to it as it will help you improve your app. This entry was posted in WinRT and tagged App, C#, puzzle-frenzy, puzzle-frenzy-kids, Win8, Windows Store, windows8, WinRT, XAML on August 7, 2013 by Mihai. Puzzle Frenzy Update 1 is now live in Windows Store! I’m pleased to announce that Puzzle Frenzy Update 1 has passed certification and is now live and ready for download in Windows Store. As a consequence the app feels and is faster, more responsive, consumes less memory and delights the users with more animations. Check it out in the Windows Store! 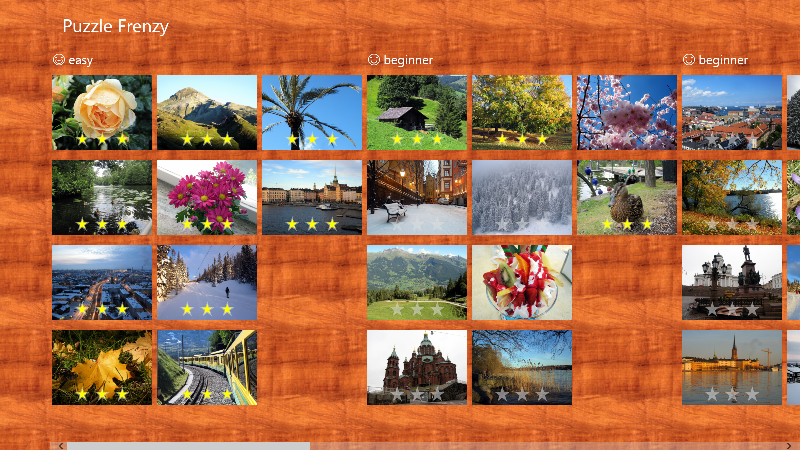 This entry was posted in Advanced, C#, WinRT and tagged puzzle-frenzy, Win8, windows8, WinRT on February 22, 2013 by Mihai. When I first started working on Puzzle Frenzy I wanted to maintain both the original WP app and also to create a new WinRT app by reusing and sharing as much code as possible. 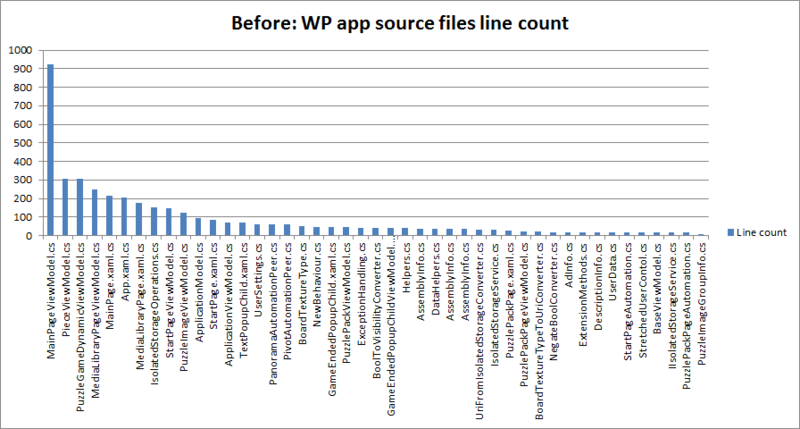 My plan was based on the presentations at Build which promised which promised up to 70% code share between WP and WinRT. In particular check out Create Cross-platform Apps using Portable Class Libraries. I initially started building the WinRT app adding new projects to the solution containing the same files as the WP. While a low of classes in the WP and WinRT are “identical” in functionality, they are often not in the same namespace. On top of that, using the same source files in more then one project is by itself problematic. 2.Having the physical same file referenced by two projects in Visual Studio is a lot of work. Whenever something breaks for one project (90% of the time due to a usings declaration change) the file containing the error has to be opened from the context of the failing project. If the file is opened in the other project the error won’t be highlighted in the code and the solution won’t compile. For few files, this setup can be maintained even if it is inconvenient. However, as the file count grows, keeping up with the changes is a too complicated task. For the appropriate scenarios Portable Libraries are awesome. It eliminates the need for duplicated files altogether as the library can be referenced by both the WP and WinRT. In my case however I wasn’t able to use them because I use Point and Size classes throughout my project. These classes are not available in Portable Libraries. I could have created my own implementation of Point and Size to overcome this limitation, but given the scale of the changes I preferred not to do it: a simple search reveals that I use these classes in more than 100 places in my code. From what I’ve experienced so far, Portable Libraries offer limited classes to work with. My ViewModels layer which I was planning to keep there needs far to many things which are not available. Sharing code between WP8 and WinRT can prove to be troublesome. Both duplicate projects and Portable Libraries have limitations, making it in my case are quite challenging to use. If sharing the code between the two apps is really your goal, I am fairly confident it can be achieved. However, in my case, for this particular app, attempting to share the code only slowed me down. In the end I kept using duplicated projects but I am not maintaining them at the same time. I take turns in development cycles implementing features and adjusting the code to work on the other platform. While doing so I introduce bugs in the project not being maintained at the time, but the amount of work needed to fix it is far less than implementing new features at once on both platforms. If you start developing a new app and want to target WP and WinRT consider using Portable Libraries from the start. It will have some limitations but will also force you to place the code in the right place in order to be shared. If you already have an WP app and want to migrate it to WinRT you might want to start by maintaining duplicated projects in order to limit the size of the changes needed. Once you reach a stable state you can of course look into moving towards Portable Libraries if code sharing is your goal. Have a look and see how it turned out. Jigsaw Puzzle Frenzy is available in Windows Store, check it out and tell me what you think: http://apps.microsoft.com/windows/en-GB/app/puzzle-frenzy/28238e98-ac0f-4a6b-81ea-a31a24a15acf. 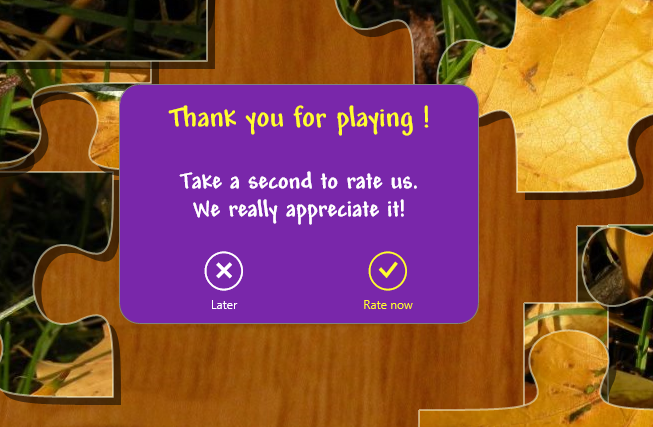 You can also give your feedback on app’s review page or on app’s Facebook page http://www.facebook.com/PuzzleFrenzyApp. This entry was posted in Advanced, C#, WinRT, WP and tagged C#, puzzle-frenzy, WinRT on February 13, 2013 by Mihai. 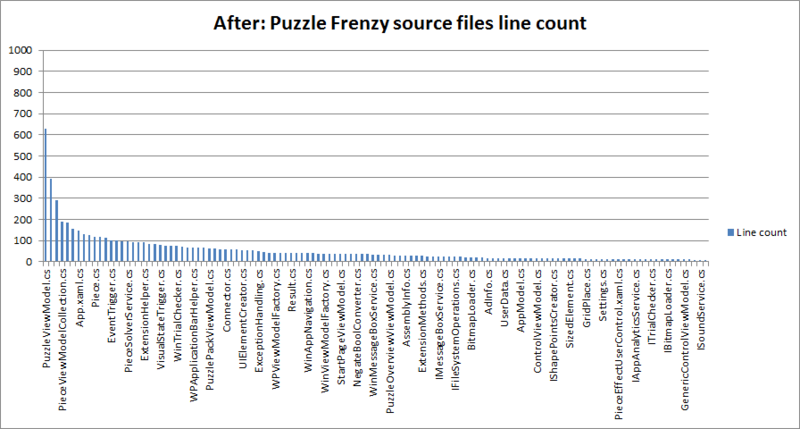 As I told you before, Puzzle Frenzy was build starting from an old app I wrote for WP7. A lot of things changed since then, and most importantly I got to read Uncle Bob’s Clean Code as well as watch some of his Clean Code episodes. Based on what I learned by reading the book I started refactoring the code. One of the thing that bothered me the most in the old code was the big source files, where I kept big classes and long methods. Over time I managed to decrease the classes size quite a lot which helps me when it comes to testing, fixing bugs or adding new features. I reduced the average file size by 39%. As you can observe I still have some old large classes, but with constant refactoring I’m pretty confident that I will manage to decrease their size over time. I’m more then excited with these changes: now the code reads better, I can understand easier what it does, and I have more confidence in it. I strongly recommend the above-mentioned Clean Code book, it contains some priceless advice. This entry was posted in Advanced, C# and tagged C#, puzzle-frenzy on February 8, 2013 by Mihai. Puzzle Frenzy Windows 8 app has been released!!! I am pleased to announce that the Puzzle Frenzy app has been release in Windows Store! Puzzle Frenzy is a realistic jigsaw puzzle game which features over 70 hand-picked images, ideal for puzzle solving. The game contains several difficulty levels ranging from 16 to 100 pieces. During the game you can shuffle or sort the pieces and also get hints in case you get stuck. If you have any comments or suggestions check out our Facebook page or drop us an email at puzzlefrenzyapp@gmail.com. The page contains details about the game, the story behind some of the images as well as news and updates. I’m looking forward to your feedback and I hope you enjoy the game! This entry was posted in Advanced, C#, WinRT and tagged puzzle-frenzy, WinRT on January 30, 2013 by Mihai. Puzzle Frenzy was built on top of a previous app I wrote for WP7. At that time the app was more simple and the gameplay more limited. The images used, the pieces shape and the difficulty levels were different as well. For Puzzle Frenzy one of the first things I changed was the puzzle pieces shape. A great deal of attention was dedicated into making them as familiar to the user as possible. The WP7 app was using a simple rectangle and four ellipses as connectors for drawing puzzle pieces. Now I use a Bézier curve with 10 control points for each edge of the piece. Therefore each Puzzle Frenzy piece is a Bézier curve with 40 control points. This entry was posted in Advanced, C#, WinRT and tagged puzzle-frenzy on January 28, 2013 by Mihai.